At 13 Billion Light-Years Away, Galaxy Is Farthest To Be Measured From Earth : The Two-Way A new glimpse of what the universe looked like in its youth has been captured. 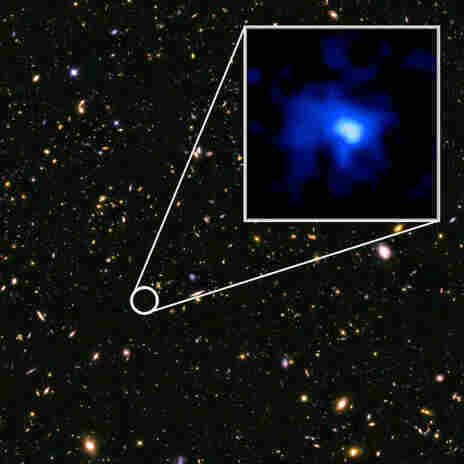 Researchers say light from galaxy EGS-zs8-1 has spent the past 13 billion years traveling to Earth. A new glimpse of what the universe looked like in its youth has been captured, thanks to researchers who determined that light from the galaxy known as EGS-zs8-1 has spent more than 13 billion years traveling to reach us here on Earth. The blue galaxy, which was named for its coloration after its initial discovery by the Hubble telescope, was studied by a team of astronomers based at Yale University and the University of California, Santa Cruz.
" 'We can start to build up a picture of how quickly heavy elements were building up across the history of the universe. How galaxies were building up across the history of the universe.' He adds, 'These very early galaxies are the building blocks for everything that we see around us today.' "
To attach a date and distance to the galaxy, the astronomers used the 10-meter telescope that's housed at the W.M. Keck Observatory in Hawaii, using it with the powerful MOSFIRE instrument — a multi-object spectrograph that lets researchers study more than one galaxy at once. "The new observations establish EGS-zs8-1 at a time when the universe was undergoing an important change: The hydrogen between galaxies was transitioning from a neutral state to an ionized state. 'It appears that the young stars in the early galaxies like EGS-zs8-1 were the main drivers for this transition, called reionization,' said Rychard Bouwens of the Leiden Observatory, co-author of the study."